Have seen comments regarding other French door fridge types that the ice production is very low, like 6 cubes at a time. How does this Amana do? Can it keep up with summer time and party ice needs? Ice maker is very small and ours jams up all the time when we try to get ice out. Is &quot;monogromatic stainless steel&quot; the new gray color for Amana refridgerators ? This unit's body is a completely uniform stainless steel with the same look that would match any other stainless steel appliance in your kitchen - not a matte gray color that some appliances are being carried in. Do Magnets Stick To This Fridge? I know on some stainless fridges that you can still have magnets....is this one that has such characteristics? 24.7 cu. ft. French Door Refrigerator in Stainless Steel is rated 4.3 out of 5 by 289. Rated 4 out of 5 by Eric from This refrigerator is a mixed bag, but ultimately recommended if purchased at the sale price of $9... This refrigerator is a mixed bag, but ultimately recommended if purchased at the sale price of $999.00 (yes HD does sell it at this price). Pros: Operates without issue since August 2016, inexpensive water/ice filter (model NS-UKF8001AXX-2, 2 pack), refrigerator is made by Whirlpool and matches our Whirlpool SS oven, microwave, and dishwasher, quite cooling operation, large storage area, bright LED lighting. Cons: Appears cheaply made, fit and finish could be better, top hinge on right door rubs on refrigerator, large deli drawer lid separates and falls out of refrigerator under normal operation, there are many gaps between metal/plastic and insulation material on the top of the doors and inside frame areas, ice/water maker is very loud while refilling, several areas have adhesive residue left over from manufacturing, replacing the filter can be messy. I do not regret purchasing this refrigerator. 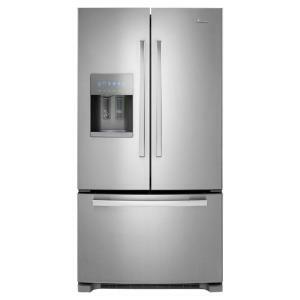 For the sale price no other refrigerator with equal features come close to this Amana model. Rated 4 out of 5 by Anonymous from Ice maker isn't as functional as some. 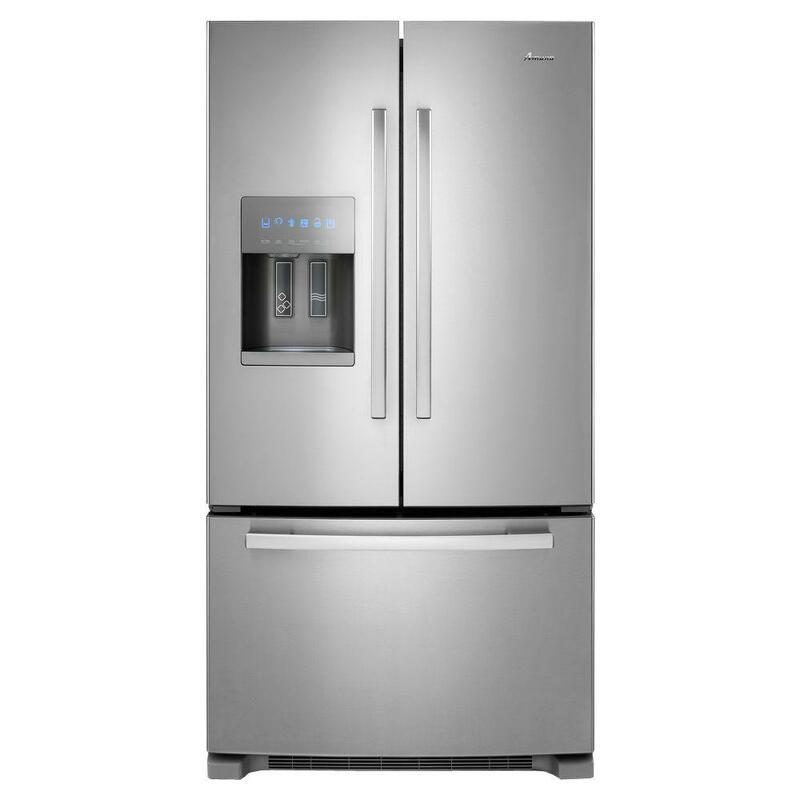 I picked up the fridge at one of HD's sales, with all discounts for $1199. At that price point for a stainless french door you don't complain. Well, most people wouldn't... but I'm not most people. The fridge (exterior) looks great... far more upscale than it actully is. The interior is nice, but not cream of the crop by any means. The door controls are easy to use and look good. Nice LED everything. My problem? Ice. I knew in buying this, that in comparison to my old Whirlpool french door that had ice storage in the door, that this Amana would be missing a lot more storage space inside, what with the ice maker taking up so much space. That in itself isn't a problem, because I'm single and a total disaster in the kitchen... meaning I don't have a lot of food on hand. A family that needs space might want to opt for in-door ice though. My beef with it is the quantity of ice. For an icemaker this size you'd expect to open it and find a small Swiss village in there. But nope... it's good for maybe two 32oz cups, that's it. Otherwise it's an awesome buy for the price. Rated 5 out of 5 by mcknzy from Very Nice Looking. I would highly recommend this Refrigerator.It is well built and the thought put into the design shows. It has a stainless front with elegant handles,The sides are painted with a color close to the front. The install was easy and the shelves were well packed on the inside of the fridge.The directions were easy to follow.The water filter was not installed so you need to do that and while your at it you might as well write down the filter number to keep with the Manuel,Easier to order if you already have the number handy. The shelves have a lot of different adjustments so finding the right height is easy.The freezer is large with two areas for frozen foods.Temps hold true,checked with a fridge and freezer thermometer. This Is a beautiful looking refrigerator that should last for years. Rated 5 out of 5 by HomeDepotCustomer from Expect less door storage then non-french door refrigerators could be a problem container items that one would normally place in the door panel (milk, soda, juice, etc.) could be a problem if you use a lot of these types of items. However, the freezer space is well designed and spacious. the interior is well designed and functionally attractive. The overall appearance of the unit is attractive and substantial. The change of color on the sides of this unit from the typical black colored surface to a grey is very appealing and blends nicely with stainless steel. I had a problem with electronically setting ice machine and temperatures (my inability to interpret instructions correctly) but a call to Amana was graciously and effectively handled by Amana representative and I was guided through the process via telephone. Rated 5 out of 5 by Kmbrt from Great Space and good features Very nice stainless steal finish. Is has a ton of room in the fridge and freezer sections. I like the quick cool drawer as this not only quick cools but gives you extra space for you drinks. The french doors gives you plenty of room with nice adjustable shelves that also slide in and out for easy access to you items. The lower freezer is quite large with 2 pullout drawers that make it very easy to sort your items in the freezer. The ice maker and water dispenser is very easy to hook up and works quite well. Over all this is a top notch fridge that looks great and has all the features and storage you would want. Rated 4 out of 5 by Ruth666 from very good French door refrigerator For the price, this is a very good refrigerator. It's quiet, very energy efficient, and holds a great deal of food, both in the refrigerator and the freezer. The ice maker is a great feature, as is the keeper for fruits. Lots of storage space for vegetables. The only minuses are the fact that it's hard to stop fingerprints showing, and that the front door has a mysterious dent in it after only a few days of use (did we do it? did the guys installing it? whatever: it shouldn't happen after only a few days). Also the ice make can get clogged up: has happened twice. Also, food stored near the ice-maker inside the refrigerator tends to freeze. But otherwise, very good value for the money. Rated 5 out of 5 by RLO1951 from The best refrigerator we ever had This is indeed one beautiful fridge, everything is one colour and that is what monochromatic means, just a design and not an actual type of stainless steel. It is a very large capacity fridge with many different storage options and functions. Fast cool option is very helpful and convenient if you want to cool soft drinks or juice as soon as possible. The LED lighting provides a very bright light and I am sure very energy efficient. Tap touch controls are amazing and make management of the fridge a very easy and enjoyable task. The fridge has so many useful and helpful functions that it is impossible to list every one here. The fridge is very beautiful not only from outside, but inside as well. We can say without any hesitation that it is the best refrigerator we ever had.